In the last addition to my free price action trading course, we went over the bearish engulfing pattern. In this article, we will go over trading the bullish engulfing candlestick pattern. The bearish and bullish engulfing patterns are considered fairly strong candlestick reversal signals. The bullish engulfing pattern is essentially the opposite of the bearish engulfing pattern. Like I previously stated, in my article, Trading the Bearish Engulfing Candlestick Pattern, these engulfing patterns are often misused. Rather than revisiting all the same points again, I’ll simply define the bullish engulfing pattern, and then we’ll try to expand upon our knowledge of trading these useful candlestick signals. What is a Bullish Engulfing Candlestick Pattern? The bullish engulfing pattern consists of a candlestick that opens at or below the close of the previous candle (almost guaranteed in Forex), and then closes above the open of the same [previous] candle. As I stated before, the most effective way of trading these signals is based on the price action of the real bodies (open to close) of the candles – not the total range (high to low). I’m defining a bullish engulfing candlestick pattern as one in which the bullish real body of a candle engulfs the bearish real body of the previous candle. In some frequently gaping markets, you may encounter cases in which a bullish candle engulfs another bullish candle. I don’t have experience with these, as I am purely a Forex trader. Effective candlestick patterns must be traded within the context of the market. Since this pattern is considered a bullish reversal signal, a true bullish engulfing pattern will only come after a bearish movement in price (consecutive lower lows). Note: Occasionally, you may find engulfing patterns occurring during periods of market consolidation that would have been effective, but we are only interested in what usually happens – not what occasionally happens. In the long term, you will lose more often than you win by taking these signals during consolidation periods. In the image above, you will see a small bearish movement in price, followed by a bullish engulfing candlestick pattern. You could have made a nice profit by entering a buy position at the open of the candle following the bullish engulfing pattern. Placing your stop loss at the bottom of the bullish engulfing candlestick, this trade would have been worth nearly 2x your risk. 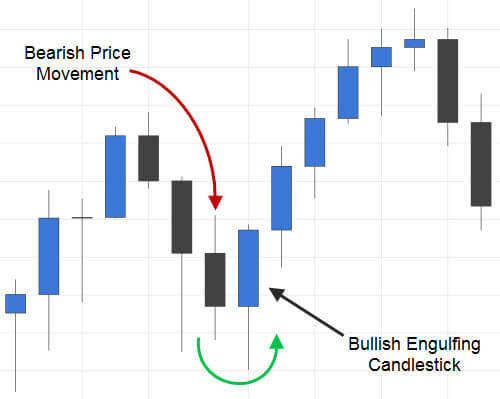 Like many of these candlestick reversal signals, trading the bullish engulfing candlestick pattern is usually more effective, or at least a higher probability trade, when it follows a sharp decline in price. The reason for this is pretty simple; market prices are driven by psychology. After a sharp incline or decline in price, traders lose faith that the market can sustain such a sharp incline or decline for long. While amateurs may try to chase price, the big players will start taking their profits or entering trades against a quick, volatile price movement (see the image below). 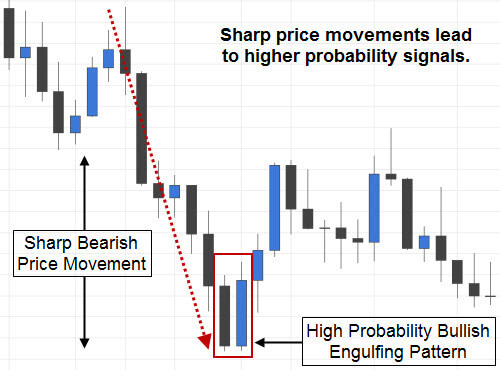 Sharp price movements are not, however, a necessary precursor for trading these patterns. Many times all that is required is a small consecutive movement in price in one direction or the other, as you can see in the first image. As I stated in my last price action article, the relative sizes of the candles involved in these patterns are important. Some traders, for instance, will not trade an engulfing pattern unless the engulfing candle is much larger than the previous candle. I have not personally found that to be any better or worse in indicating how strong the potential reversal that follows will be. In fact, if the engulfing candle is too large, it can sometimes swallow up much of the price movement, and leave you with a poor potential risk to reward ratio. The context in which these patterns occur is very important. You should never trade reversal signals from periods of market consolidation. That being said, these engulfing patterns, as well as other candlestick reversal signals, can be very effective after just a few candles have made consecutive higher highs or lower lows. Occasionally, the engulfing candle in one of these patterns will be very large. Many traders would say that a relatively large engulfing candle signifies a strong reversal ahead. However, a larger engulfing candle requires a larger stop loss in pips (obviously), and may lower your potential risk to reward ratio. Enter such trades with discretion. Typically, an engulfing candle that engulfs more than just the previous candle is an even stronger signal. The more candlesticks that are engulfed, the stronger the signal. Again, keep in mind that the larger the engulfing candle, the less likely it is that you will be left with a favorable risk to reward scenario. Since candlestick signals are only reliable in the short term, there is no guarantee that price will continue to move in the direction that is indicated by the signal. Lastly, any good trader will incorporate good support and resistance levels into their trading signals. Engulfing patterns that are bouncing off of relevant support or resistance levels are more likely to reverse. Previous swing points, obvious supply and demand levels, relevant Fibonacci levels, trend lines, dynamic support and resistance, etc… should be considered when taking these trades. Engulfing patterns can be very profitable, if you know when to take these signals and when to pass on them. Using a good trading system, especially one works well with candlestick signals, like the Top Dog Trading or Infinite Prosperity systems, can help you qualify the best signals to trade. After a little screen time with your demo trading platform, you should be trading the bullish engulfing candlestick pattern just like a pro. Hello Austine. Thanks for the kind words. This made my day. I’m so glad I could help you. As far as other patterns go, you definitely got started with a good one. The strongest short-term price action patterns are the engulfing patterns, the pin bars (hammer and shooting star), and the star patterns (morning and evening star). Honestly, the engulfing patterns are one of my favorites. If you just focused on being an expert at these patterns, you would do pretty well. Don’t over-complicate things. If this works for you, you may just be an engulfing trader! Your teaching is wonderful, Please will I use confirmation candle for bullish engulfing candle trading? Yes, osusu. Trade it the same as the bearish engulfing pattern. The engulfing patterns always confirm higher or lower by their very nature. However, if you get a weak signal, like a small bearish engulfing pattern or a bullish engulfing candlestick that doesn’t close within the upper 1/3rd of its range, you can always wait for another strong bullish candlestick or just skip the trade altogether. Regarding the price action, which chart time frame do you recommend to be more effective? The higher the better because you won’t have so much random market noise and more solid signals. Having said that, I don’t usually trade higher than the daily chart and the majority of my trades actually come from the 15-minute chart. There are a couple of reasons for that. First, you’ll typically get more trades on the 15-minute chart than, say, the 4-hour chart because more 15-minute candles will form during any given time period. Second, my main trading system, DTFL, trades exclusively on the 15-minute charts.